French startup Spendesk might be just a few months old, but the company is currently firing on all cylinders. 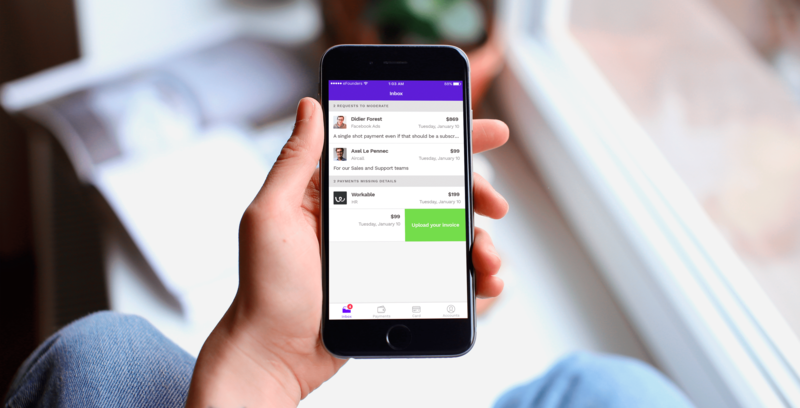 Spendesk just raised $2.2 million (€2 million), rebranded itself, and is about to launch mobile apps and corporate plastic cards for everyone. The company started out as an eFounders startup, but it is now ready to fly on its own and work without the eFounders team. Investors in today’s funding round include Kima Ventures, Funders Club and angel investors Edward Lando, Nicolas Steegmann and Frédéric Montagnon. More surprising, a few Spendesk customers have chosen to back the company after using the product for a few months. The founders behind Birchbox, AB Tasty, La Belle Assiette and Tinyclues also participated in today’s round. The purpose of Spendesk is quite simple — expenses in France are broken. First, you need to provide a detailed itemized receipt for everything you purchase. Even if you spent €3 for two coffees, you’ll have to take a picture of the receipt. That’s why most people don’t expense small amounts at all. Second, corporate purchasing cards are nowhere near as widespread as in the U.S. In many companies in the U.S., your company’s bank will hand out a corporate card to most employees so that they don’t have to spend their own money for plane tickets and other expenses. In France, you often have to pay with your own personal card and you’ll get the money back a month or two later. Third, expenses are a big headache for accountants and finance departments. They have to manually fill a ton of forms and ask for invoices all the time. It’s a big waste of time. Spendesk wants to solve all that with a full-fledged corporate spending solution. The basic premise hasn’t changed since I first covered Spendesk, but the startup is taking it one step further. After creating an account, you can upload money to your company’s Spendesk account. The money is safely stored into an account that is managed by The Bancorp. Then, you can allocate some money to your employees. You can say that some employees can only spend up to a $1,000 per month while others can spend $10,000 a month. After that, your employees can pay for their expenses without having to use their personal cards. On the internet, they can use a virtual MasterCard. In the good old real physical world, they can use a plastic card. What if you need to pay for the entire team’s flights for an event? You can request your manager’s approval for unusually high expenses. Your manager gets a notification and they can approve it directly in Spendesk. While some customers could already use plastic cards, Spendesk is going to open up card orders for everyone. Literally everyone in your company will be able to get one. The mobile app is also launching very soon and should be quite useful for receipts. Every time you pay with your card, you’ll receive a notification on your phone seconds later. Swipe on this notification, take a photo of your receipt and you’re done. The finance department will find all your receipts in a single centralized interface. The combination of cards with modern web and mobile interfaces makes Spendesk a good real-time solution to track your company’s expenses. The startup now handles 3,000 transactions per week and has hundreds of customers in France, Germany, the U.K. and Spain. Customers include Deezer, Webedia, Hostmaker and Drivy. With today’s funding round, Spendesk can expand in more European countries without having to find another banking partner that complies with another set of regulations. Spendesk is a software-as-a-service solution. It costs between €8 and €15 per user depending on the size of your team — the more employees you have, the less you’ll pay per employee. The best part is that Spendesk is grabbing money directly from your Spendesk account. It feels like you’re not paying. I can see where Spendesk could go further. A few months ago, I was in China for work and I could only pay with cash. In many cases, you still have to pay for expenses with your own money. Let’s see how Spendesk can also integrate personal payments into its product so that companies can ditch their existing expensing solutions for good.